How many of you have read or watched the Lord of the Rings? What is it about? <get answers>A group (Fellowship of the Ring) whose mission is to destroy a powerful ring, and the evil one who made it.In the story, there is also a man who is heir to the throne of the kingdom of Gondor; his name is Aragorn. After their last king died, the human population in Middle Earth waned and were nearly forgotten and extinct. 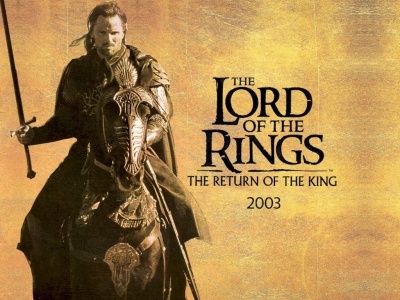 At the end of the third book/movie, which was titled “The return of the King”, Aragorn defeated the evil one’s enemy and claimed his right to the throne. He returned as the King of Gondor and Arnor, reuniting and preserving the people of his kingdom.Just as the people looked forward to the return of their king, we also can look forward to the return of the King of kings! His name is … Jesus! Nehemiah 3:29 Next to him, Shemaiah son of Shekaniah, the guard at the East Gate, made repairs. The East Gate is located opposite of the Mount of Olives. When Jesus was on earth, the week before He was going to die on the cross, He entered Jerusalem through the East Gate, riding on a donkey. What does the East Gate remind us of? Jesus is coming again. 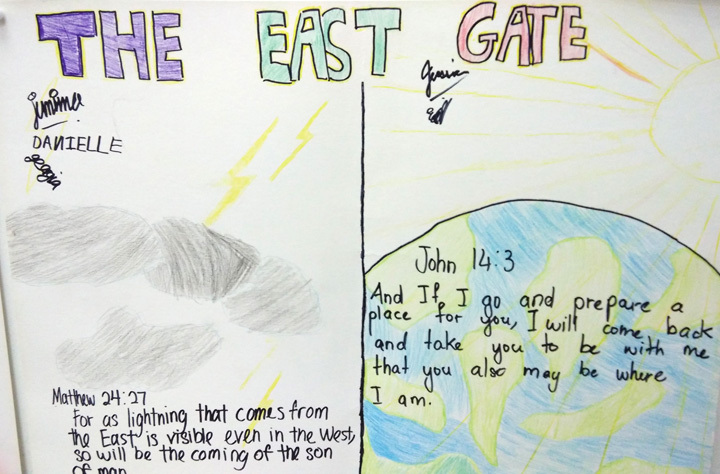 <for older kids>According to prophecy, when Jesus returns again, His feet will touch first the Mount of Olives, causing a great earthquake, and splitting the Mount of Olives in two. Then He will enter Jerusalem through the East Gate (Zech 14:4). Many years later, in 1530AD, the Arabs (Ottoman Turks) sealed up the East Gate. They believe that the Jews expected their Messiah to come through this gate, so they sealed it up to prevent His return. They even planted a cemetery in front of it, thinking that a Jewish Messiah will not set foot into a cemetery because it was not “holy”. But the Arabs didn’t know that a sealed gate will not prevent the return of the King. And by sealing the gate, they are actually fulfilling a prophecy by Ezekiel (Ezekiel 44:1-3) who has said that the East Gate will be shut. <for younger kids>How many of you go to kindergarten? Who sends you to school? Mummy? Daddy? When your parents drop you off at school, will they also pick you back after school? Yes! They won’t leave you behind. They will say, “See you later, alligator!” and they’ll promise to come back for you. And when school is over, mummy and daddy are there, just as they promised! After Jesus died and rose again, He went back to heaven. But do you know that He promised to come back for us? And He will. Every time we see the sun rise in the east, we remember Jesus’ promise and know that He will come again soon! When Jesus comes back, He will bring us back to be with the Father forever! Have you ever had someone special come to your house for a visit like a grandparent or cousins, or good friends? Sometimes we make plans for people to come and visit. What kinds of things do you have to do to get ready for company? (Clean your room, get some snacks, help clean the house, etc.) I get really excited when someone is going to come and visit. As their visit gets closer, I start counting the days until they come. Jesus is preparing His place for us, and He is coming back to bring us with Him! How will we know when Jesus has come back again? When Jesus first came as a little baby, not many people knew about it. There wasn’t a big fanfare, no newspapers or radio or Internet to announce His arrival. Only a bright star in the sky, and shepherds and wisemen who came to greet Him. But when He comes again, it’ll be as bright and noticeable as the sun, or a lightning flashing through the sky. We don’t need to read about it on Facebook. We will all see it together. Jesus promised to come again. We can look forward to it just as people two thousand years ago looked forward the coming Messiah. Jesus’ coming again = Satan’s time is up! He will be completely destroyed! Satan is scared that his time is up, so he tries to do as much damage as he can. The signs of the times — wars, famines, diseases etc — tell us that the time is near. So when we read of all these disasters, we shouldn’t be fearful. 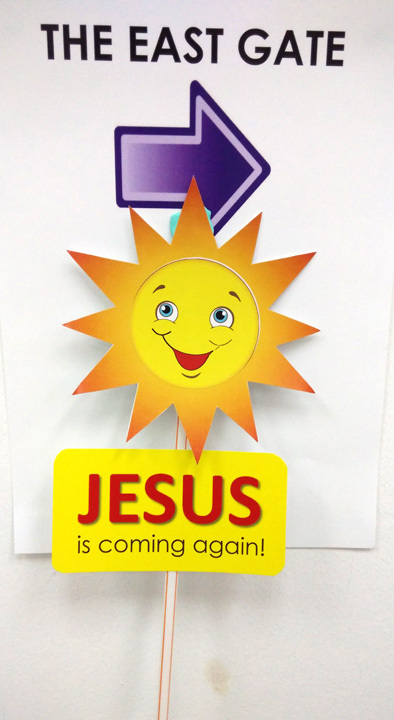 We just declare that Jesus is coming again soon! We don’t know exactly when He will come; it isn’t marked on the calendar. But every day when we see the sun rising from the east, we remember that the SON of Man — Jesus — is coming again soon. 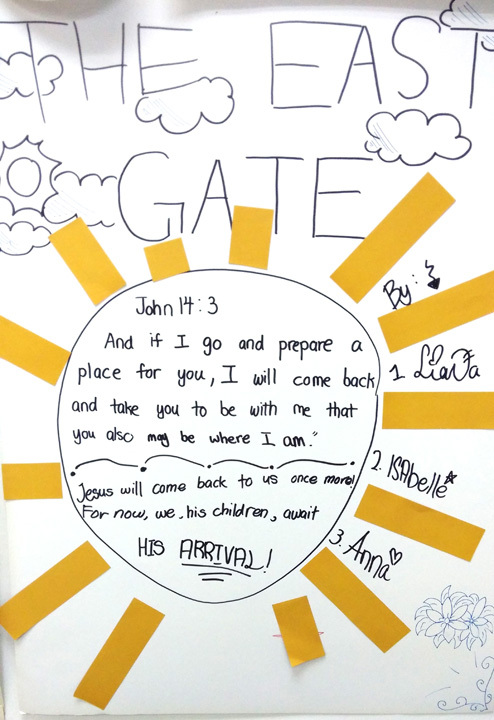 East Gate reminds us that Jesus is coming again!